Mauerpark is sparkling in brilliant sunshine. There are hundreds, maybe thousands here. “Alright! ?” an Irish voice shouts to the crowd. He’s standing beside a beatbox-turned-bicycle and a colourful umbrella. There’s a Macbook by his feet. His audience is positioned about him like in an amphitheatre. A man with tufty grey sideburns, a suit jacket and a slight hunch shuffles to the centre. He lays his cloth bag on the ground and takes the microphone. The track starts. Decker begins to croon a German love song. The tempo increases, he closes his eyes and gets to the chorus. The crowd explodes. A few more verses and it’s all over. Decker takes several modest, tiny bows before worming his way through the crowd and back out into the park. Next up is a thin teenage boy wearing a baseball cap. He sings “Every Breath You Take.” Mid-way through he stops and squints at the Macbook on the ground. He’s lost his place. The crowd fills in by clapping and soon he’s back to promising that he’ll be watching us; every breath we take, every step we take. Katie comes next. She’s a bold and bubbly American comedian. She can’t sing but she’s here to promote her stand-up show. She shakes her body, throws her head back, grabs a passionate hold of an unsuspecting man in the front row and finishes the performance by firing fliers for her next show at the crowd. We hear Brad from Arizona, who looks like a cowboy and sounds like Elvis Presley. Then comes Miss Britney. She’s wearing a golden bikini top and tiny hotpants. Then comes Ellie, a German girl who sings acapella. She’s followed by man in his fifties who brought his own lyrics, which he he unfolds like a scroll as he gets through the verses. “I got a job,” says Seán. The crowd roars with approval. Even better. The Irish MC warns Seán that he is becoming irresistible to the ladies. Katie the stand-up comedian needs no more prompting. She rushes to the stage, launches herself at Seán and falls down to one knee. 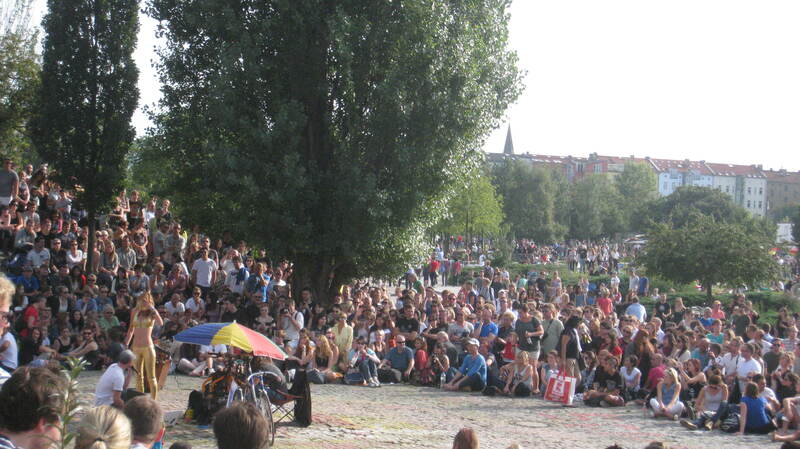 This happens every Sunday in Mauerpark in Berlin. The event was set up in 2009 by Irishman Joe Hatchiban, who uses portable, battery-powered boxes to let everyone and anyone unleash their inner star. 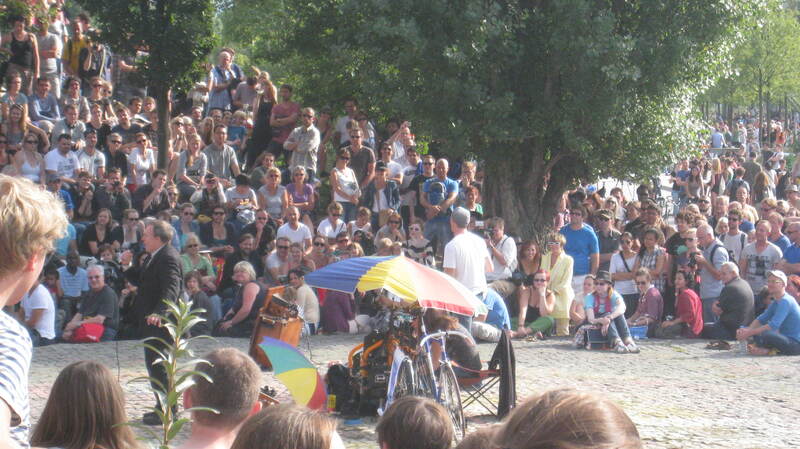 You can find out more about karaoke in Mauerpark here. It’s yet another reason to love the city. I’d like to thank a lady called Clare, whom I haven’t had the pleasure of meeting but who sent me a very kind email after my more melancholy post yesterday. She advised me to give this event a go and I’m so glad I did. As you all know, I don’t write for money (though if any philanthropist is reading..) and sometimes I wonder if it’s worth all the work. But when I hear from a kind stranger like Clare, I know it’s worth every minute. This entry was posted in Uncategorized and tagged Berlin, humor, Kate Ferguson, Life, Mauerpark karaoke, Travel, Writing by Kate Katharina. Bookmark the permalink. Thank you so much for this piece on the karaoke. The ‘flu has almost lifted so this cheered me up and made me laugh. I feel like I’m living vicariously in Berlin! Delighted to hear the flu has lifted. And thanks for the tip, I had a really great day.